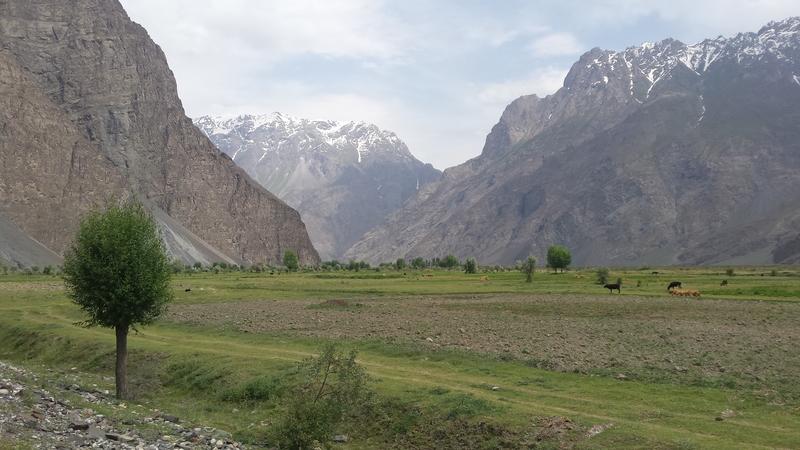 Cycling through a haze in my brain, I plodded along the valley towards Khorog. I was not really present, just feeling weak after emptying my stomach at 1am last night. The kids tried to pull me back into the now – ‘Hello hello!’. ‘What is your name?’. ‘Otkyda?’ I retired for the afternoon in Rushan and slept for 4 hours between 1600 and 2000. Our military hosts came this morning bearing more gifts – milk. Just what I felt like having. Reece needed to move on quickly today, and I wasn’t going to be able to do that, so we parted ways. As it turned out, we met repeatedly throughout the day. I was (very) slow, but steady. Reece was fast with lots of technical problems with his bike. Tomorrow on to Khorog.